This is a literate Haskell file. You can find this code on Github and follow along in ghci. In order to warm up for a round of interviews next week, I’ve been playing around with coding puzzles. Those are usually solved using imperative languages, and I thought I’d have a go at them using Haskell. I’ll share today’s experience, which hopefully will convince you that purely functional languages are (sometimes) suitable for puzzles. ====Disclaimer: There is probably nothing new here. Also, there might be better solutions to solve the problem. I like this solution because it gave me an excuse to showcase Haskell’s laziness. Feel free to ping me if you come up with something better. ====The puzzle Let’s start with the problem itself. You are given a number, x0, and a target, xf. You are allowed two functions: f(x) = 2x + 1 and g(x) = 3x + 1 . Give either the minimal number of applications of f and g that you need in order to reach xf from x0, or state that one cannot reach xf from x0. 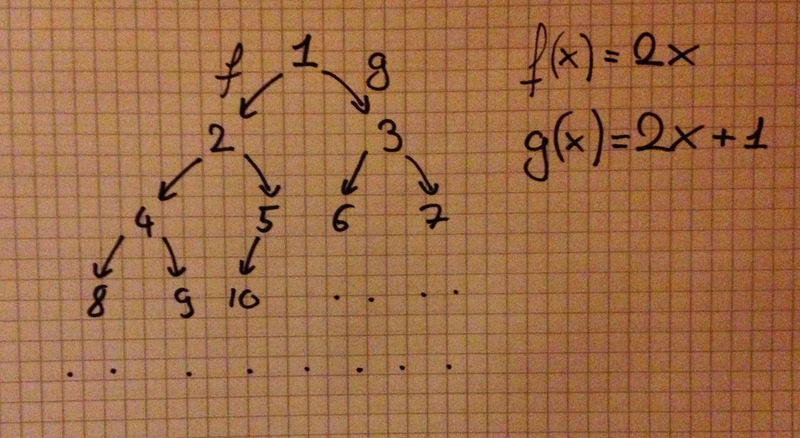 you cannot reach xf = 8 from x0 = 1.
we know that we can safely stop whenever we hit a node with depth d > 4 ⋅ x. Clearly the number of nodes traversed (assuming a BFS) is proportional to the exponential of the depth (it is actually 2d). But we also know that there is at least a factor 2 between each “layer” (∀x > 0, f(x) > 2x). 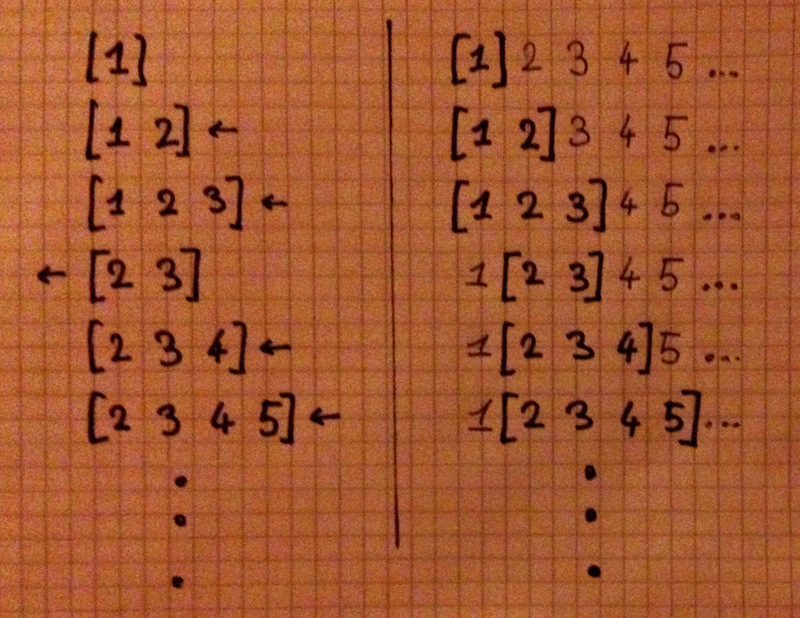 So we can conclude that xf − x0 > 2d and so our algorithm should run in O(xf − x0). Now let’s write some code. We keep the links to the children lazy so that we can build an infinite tree. Whenever we create a node it is very likely that we will need the data it contains, so we keep the data strict. This is a typical lazy spine/strict leaves structure, and has the added bonus of easily allowing GHC to unpack the Ints. Dequeue a node from the queue and append it to an output list. Enqueue all this node’s children. Repeat until your queue is empty. Whenever you want to enqueue a value, you cons it on back. Whenever you want to dequeue a value, you uncons it from front. And whenever front is empty you replace it with back (in reverse order). This gives you worst-case O(1) for enqueue and dequeue operations, and O(n) for tail (that’s where you’ll reverse the back, see Okasaki’s Purely Functional Data Structures for a good overview). Easy enough. Now we just need a State Queue monad, traverse the tree, and update our queue every time, discarding the old one. Also, we’ll need a Writer [Tree] to output the nodes. Right? Well, in our case we can do much simpler. We will simply use a list and take advantage of the language’s laziness. We’ll take a list of nodes and return a list of their children. It will extract the left and right children of a node, then move to the next node, repeat the process and concat the result. Sweet! When concatMap is called the first time, it’ll split the root into its left and right children. This means that the root’s left child is now the second element in nodes. When concatMap has to work again, it’ll spit out first the left child’s own children, then the right child’s own children, etc, concating the children lists every time. Looks like we have a breadth-first search using a list instead of a queue! And added bonus, we got rid of Queue’s O(n) worst case, since we never even tail! In this case, a queue is nothing more than a window, or slice, of a list. Every time we enqueue, we expand the window to the right. Every time we dequeue, we shrink the window on the left. This is unfortunately not an all purpose queue. Once the first cell of the list is created, all the remaining ones must be determined already.